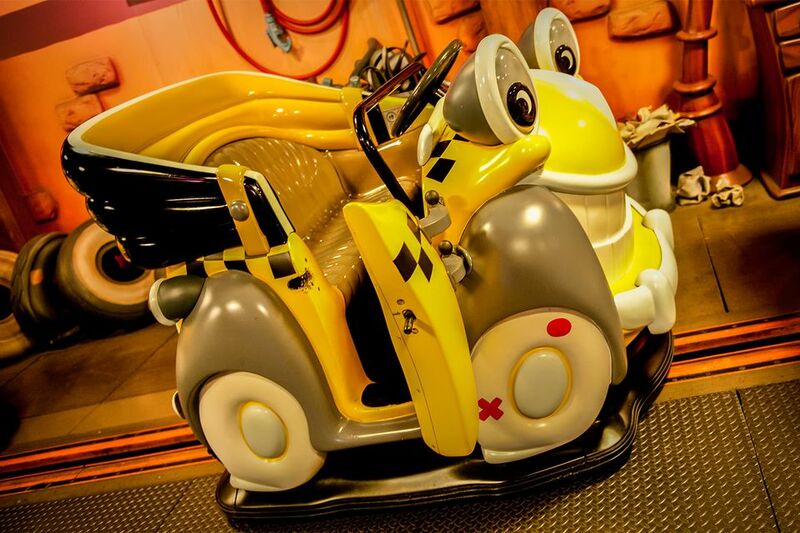 Riders take a wild taxi ride through Roger Rabbit's wacky cartoon world at Disneyland. Here's a quick overview of the story: You have rented a toon-style taxi cab named Lenny (a cousin of Benny the Cab) for a tour of Toontown. You're just getting on the way when those evil weasels throw a bunch of slippery, toon-killing Dip on the road. Your taxi spins out of control while you chase the villains through town. The weasels are out to kill Roger, who is traveling with Lenny's brother Benny. You'll zip down the streets, crash into Bullina’s China Shop (get it? bull in a china shop?) and careen through the powerhouse where Roger Rabbit is having a fight with Psycho. Then it's on to the Gag Factory and near destruction, averted by Roger's quick action using a portable hole. You can steer your vehicle in all directions as you struggle to keep control. The queue for Roger Rabbit is long and indoors. A 30-minute wait will take place completely inside. It’s a noisy wait, both from the in-queue entertainment and the noise everyone else makes around you. In fact, a shrieking baby (or maybe worse, one who needs a diaper change) can leave you wondering where to get one of those portable holes so you can get out of there - quick. For that alone, it’s worth using the Fastpass system instead. We polled 219 of our readers to find out what they think about Roger Rabbit. 84% of them said It's a must-do or ride it if you have time. Location: Roger Rabbit is in Toontown. Wait factor: High. 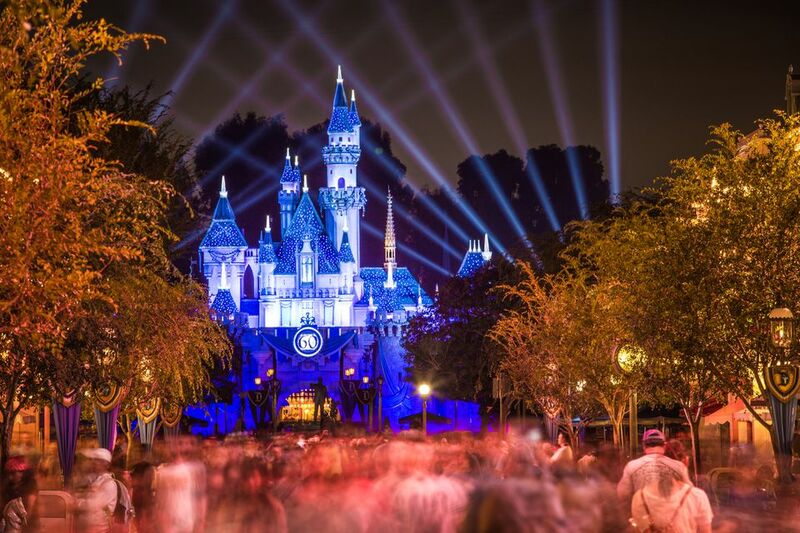 Use a Fastpass to shorten your time in line, or try getting in line during the parades or evening shows. But not on evenings when there are fireworks because Toontown will be closed. Herky-jerky factor: Medium. If you have back or neck trouble, just don't spin the car, and the ride will be much smoother. Seating: Ride vehicles looks like a cartoon car. Each one has a bench seat and a steering wheel and can hold two to three people. You step slightly up to get in. Accessibility: You have to transfer from your wheelchair or ECV into the ride vehicle by yourself or with help from your companions. Wheelchairs enter through the FASTPASS line and ask a Cast Member for help. Park ECVs outside. This ride uses strobe lighting effects. The entry queue area has very cute themes that make the time pass quicker. In fact, it's so cute that you may want to pass on that FASTPASS and wait for a time of day when the line is not too long. When you're in the queue, knock on the door to the Ink & Paint Club and say Walt sent me. You may catch Jessica Rabbit's show. Roger Rabbit is one of the best rides at Disneyland. On other websites, you might read an outdated tip about Roger Rabbit FASTPASS. It says you can hold a FASTPASS to Roger Rabbit at the same time as another FASTPASS, but that is no longer true. One of the most fun things about this ride is the signs in the queue. We'll clue you into a few. While standing in line, look for license plates such as 2N TOWN (Toontown), 1DRLND (Wonderland), 1D N PTR (Wendy & Peter), IM L8 (I'm late - The White Rabbit), CAP 10 HK (Captain Hook) and 3 LIL PIGS (Three Little Pigs). In the back alleys, one wanted poster reads "WISE GUY WEASEL WANTED IN THIRTEEN STATES FOR TOON NAPPING, ASSAULT WITH A SILLY WEAPON, PETTY LARCENY, GRAND LARCENY AND REALLY GRAND LARCENY." Go find the rest for yourself - it's a great way to keep the kids occupied while you're waiting. Outside the ride, you should mess with anything that looks like you could pull it, open it, push its button or otherwise make something happen.